This is another simple sympathy card I made for a colleague. I think this dreamy flower is useful for so many occasions! I used antique linen, tumbled glass, broken china and weathered wood distress inks to create the inky halo effect with an applicator tool. 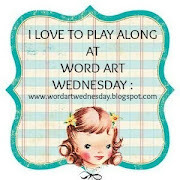 I'm also linking up to Word Art Wednesday where it's also an anything goes challenge. 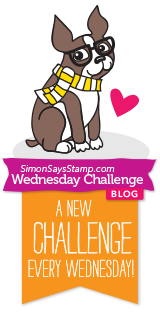 I'm also linking up to the challenge at Penny Black at Allsorts where it's anything goes with a stamp. Penny Black Dreamy stamp; versafine ink & clear ep; distress inks; sentiment sticker. That sponging around the flower is just stunning. It makes the flower center stage and looks beautiful for a sympathy card. A beautiful CAS design, loving the embossed sentiment! this is a beautiful sympathy card! so elegant and softly coloured! thank you so much for playing along with us at penny black and more! Lovely clean and simple card. Love your soft colour shading. I am also in Country NSW. Simple and oh so elegant! So pretty with the inking and matting.